Crutches are a type of Walking Aids that serve to increase the size of an individuals Base of support. There are mainly two types of crutches; axillary crutches and elbow crutches. 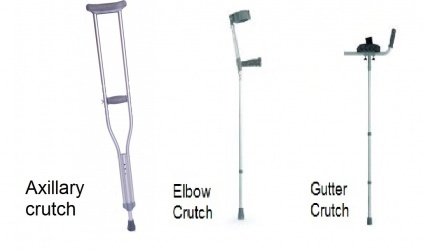 Gutter crutches are the third additional type of crutches. Forearm crutches also known as lofstrand or elbow or canadian crutches. Thier design includes a single upright, a forearm cuff and a hand grip. The height of the forearm crutches are indicated from handgrip to the floor (adjustable from 29 to 35 inches or 74 to 89 cm). Gutter Crutches also called adjustable arthritic cruches or forearm support crutches. These are additional type of crutches, which is composed of paddded forearm support made up of metal, an strap and adjustable hand piece with rubber ferrule. These crutches are used for patients who are on partial weight bearing like Rheumatoid disease. It is essential that crutches are measured and adjusted to suit every patient they are given to. There are various methods to measure both the canes. 2 point : this gait pattern is less stable as only two points are in contact with floor and good balance is needed to walk with 2 points crutch gait. 3 point: this gait pattern is used when one side lower extremity (LE) is unable to bear weight (due to fracture, amputattion, joint replacement etc). It invloves three points contact with floor (two crutch point and one unaffected LE). Has lost the use of a limb (it is either injured or amputated). Is having problems with Balance and impaired strength. ↑ 1.0 1.1 1.2 Gardiner DM. The Principles Of Exercise Therapy, 4th ed. india: CBS Publishers & Distributors; 2004. ↑ 2.0 2.1 O'Sullivan SB, Schmitz TJ, Fulk G. Physical rehabilitation. FA Davis; 2013 Jul 23.